Eric Peterson has dedicated 20 years of his life to the video game industry, handling development and production in startups and large studios alike. He has a passion for space games, and in April 2012, he helped found Cloud Imperium Games, the studio building Chris Roberts' massive interstellar simulator Star Citizen. Cloud Imperium has since raised $78.6 million from nearly 900,000 dedicated fans, with more adding to the pot every day; it's the largest and most ridiculous crowdfunding campaign in gaming history. Late last year, Peterson walked away from Cloud Imperium, Star Citizen and that pile of cash. Not because he wasn't into the game anymore; he just didn't want to leave his home in Austin, Texas. "I loved working on the project; I just didn't want to move to Los Angeles," Peterson says. "They're my friends. Look, I built that company with them. ... It's just that, I've made sacrifices before in this industry for games that almost cost me personally with my family. So I'm just not willing to do that anymore. The priorities for me are family first." Family may come first, but it's followed closely by his new passion project, Descent: Underground. It's a new take on the classic space shooter, Descent, and Peterson is trying out his crowdfunding luck once again. His new company, Descendent Studios, is looking to raise $600,000 on Kickstarter to make the game a reality. The campaign ends on Friday, April 10th, and as Peterson and I talk, it's about $120,000 shy of that final goal. Still, he's "cautiously optimistic" that things will work out. He's done the research: Kickstarter projects that are 60 percent funded by their final two days receive a 40 percent boost in donations right at the end. "We don't go into anything planning to fail," Peterson says. "There are other options that we've discussed, but right now we're totally focused on getting the Kickstarter to the finish line. ... Kickstarters are kind of a weird deal, where you have to capture that imagination in the timeframe that you're given, or else you don't get anything. We are in the final days. We've done pretty well so far." Peterson witnessed the miraculous nature of Kickstarter first-hand with Star Citizen, a campaign that asked for $500,000 and ended up with more than $2 million. Funding for Star Citizen continues on its own website, and Peterson will use this same model for Descent: Underground. "If we came out and said we wanted to do the whole big experience with single-player and everything, we'd be between $1.5 and $2 million." The Descent: Underground Kickstarter is step one: $600,000 is a lot of dough, but it's only enough to fund the main multiplayer portion of the game. Descendent Studios plans to add a robust single-player campaign and user-created content (with revenue share for successful creators), but the initial game will not contain every aspect on Peterson's production list. The Kickstarter campaign promises an introductory single-player mission, cooperative play and multiplayer modes, with a variety of ships and maps. After that, the full Descent: Underground will essentially be released in phases. "If we came out and said we wanted to do the whole big experience with single-player and everything, we'd be between $1.5 and $2 million," Peterson says. "I think that's probably too high for Kickstarter today, at least for us as developers." The team didn't even set out to build a new Descent game. After all, Peterson notes, anyone who wants to boot up Interplay's original Descent can do so now. Peterson did want to build a space shooter with six degrees of freedom, meaning the ships can move in ways that mimic real space shuttles or planes, and he was a longtime fan of Descent's mazelike corridors and tight-quarters battles. "We were building a six-degrees-of-freedom game called Ships That Fight Underground, or STFU for short as a working title," Peterson says. "And we were approached by Interplay, who said, 'Would you guys like to do Descent?' Of course the obvious answer is, 'Heck yeah.'" Building something in the Descent universe brings its own set of issues. Nostalgia is a driving force for many backers, though the game is something different in every player's memory. To some players, it's a maze-solving kind of game, while others loved it for the co-op and still more fondly recall the competitive multiplayer experience. "The one thing we didn't see or didn't understand was how fractured or how different everybody views what Descent was," Peterson says. "Descent, to each individual person, is a different thing. ... As we're going through this, we have to make sure that we are satisfying all of those people with what we're developing and giving those people something that scratches that itch." Of course Descendent Studios can't rely on the nostalgia market alone. "My kids are 16 and 12," Peterson says. "They've never played the original and they look at it now and say, 'Well, those graphics look bad.' It probably wouldn't hold their attention as much as some of the games that are out there today that have all of these other, richer experiences. We want to make sure that we get both. Most people on Kickstarter, honestly, have never played Descent." The new Descent: Underground will feature all of the modern bells and whistles that Peterson's kids expect, including achievements, unlocks, modding and a class system that makes each ship powerful in its own way. The goal is to create a fun, arcade-like experience, where players can load up a game and play for just 20 minutes at a time, if they want. 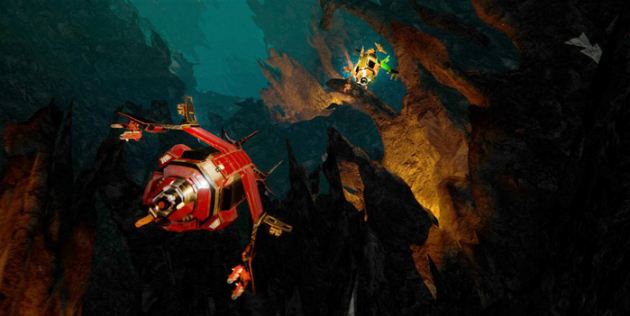 First, Descent: Underground needs to raise $600,000. Peterson isn't planning on failing, but this is a potential reality he has to consider: If the Kickstarter doesn't make it, Descendent Studios may not exist anymore. "You can scream in the wind and publishers are not going to listen." "We're all working right now for free," he says. "Essentially this is a passion project. I put in quite a bit of money out of my own pocket to make this work, so that we have lights, an office, all this other stuff." Kickstarter is Peterson's opportunity to turn passion into a product. He loves Kickstarter, he says. It gives people the ability to create cool and innovative stuff, if the project picks up speed, if enough people back it, if it looks fun to a large enough audience with deep enough pockets. "People have a voice, but you can scream in the wind and publishers are not going to listen," Peterson says. "They've got their numbers; they've got their bottom line. 'We're going to make another Call of Duty,' whatever, right? So, what Kickstarter allows people to do is to create cool and innovative stuff." If enough people support those cool projects. If enough people support Descent: Underground.